Many inventions that today are the basis of our work have seen the light thanks to the great investigators of reality: from Archimedes to Brunelleschi and many more! "The part of each thing is itself the nature of the whole"
One above all had the ability to take inspiration from their works, their ideas turning them into effective and efficient, until give them a new life. This man is Leonardo da Vinci. He made the life of Archimedes more than an ingenious tools to raise the water from a well: he made it a system to bring the water on top of buildings, with a bigger range and faster speed. An all-Italian genius who made the Brunelleschi’s crane not only a means to lift weights, but also a means able to move them simultaneously. Object more or less simple become, in his hands, members of complicated gear, never designed before. The best of an era and for a long time yet. For this reason Leonardo is our inspirer! He understood how every little part is crucial for the functioning of the whole, but not only this! Each object is a source of inspiration for always new complex mechanisms. 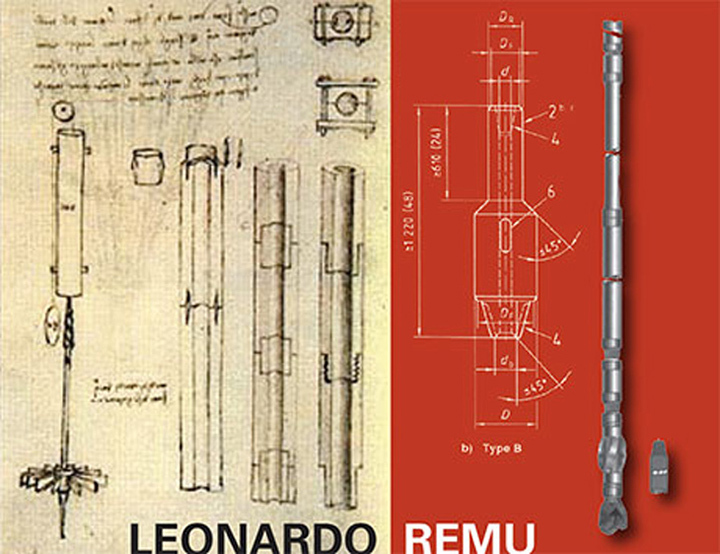 Some of our products have an ancestor among the papers of Leonardo, with amazing similarities. Hydraulic drilling to create modular wooden pipes. The low rays was put into rotation by the force of water, at the same time the weight of the trunk let the drill perforate it. The descent of the wooden form is automatically regulated by a counterweight connected to the trunk through a pulley: changing the mass of the counterweight, the pressure of the trunk above the drill changed too. among the product in accordance with API norm, intended for the OIL&GAS market, there are the elements that compose the drilling battery. The functioning principles of drilling battery come from the principles of modular drilling of Leonardo. studies for the toothed pulley or chain, that will become the basis of many of his inventions. Leonardo noticed how often the limit of lifting pulley was the fragility of the rope. For this reason he invented a flat ring chain to replace the rope, and a wheel whose teeth were going to connect with the rings during rotation. This innovation allowed to lift loads much heavier than before and subsequently was used for many other things, and still it is. For example: the casing of the bicycle and different systems for the transmission of the movement between gears. 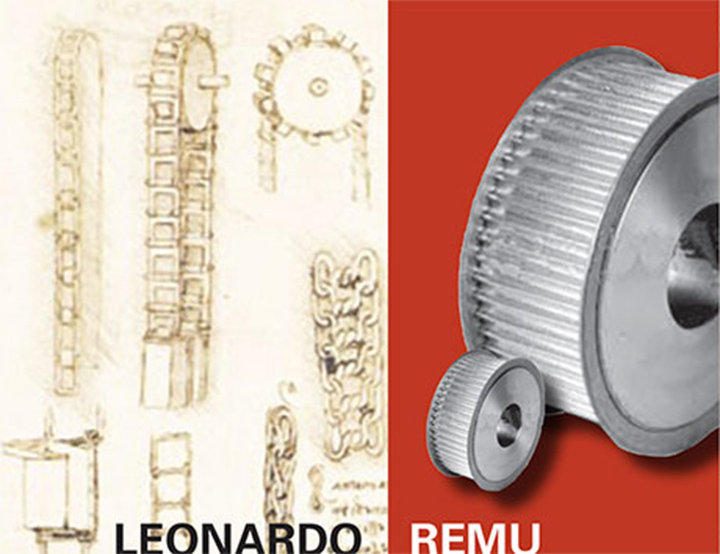 the working principle of the toothed pulleys, manufactured for the rubber and polyurethane market and the produced gears, come from these extraordinary discoveries of Leonardo.